Help us kick-off the Dallas Cultural Plan! Join us at 10 am on Saturday, September 30th, at the Red Bird Mall/Southwest Center Mall for the fourth of four kick off events being held across the city. Don’t miss your chance to participate in this exciting opportunity to shape the future of arts and culture in Dallas! Doors open at 10:00am, the program begins at 10:15. 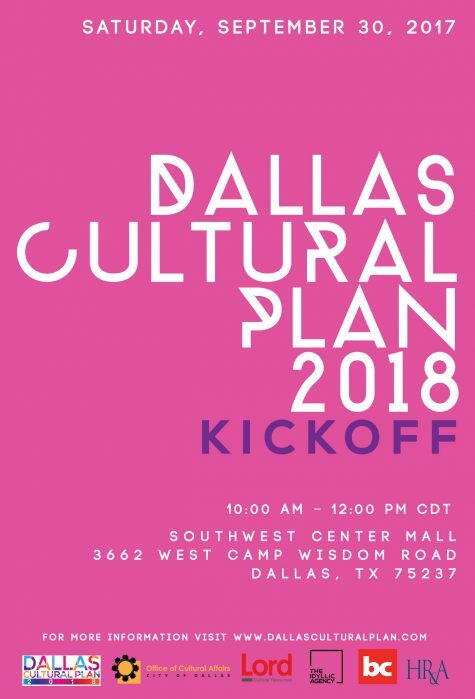 During these public conversations, in a variety of activities, you will learn about the Dallas Cultural Plan 2018 process and share your thoughts, hopes and dreams for Dallas’ cultural future. We hope you’ll join us for this exciting event on September 30th.